The city of Hastings will be home to the country's first commercial hydrokinetic station. Hydrokinetic means making electricity from moving water, without the need for a dam. A turbine suspended from a barge in the Mississippi River will produce about 100 kilowatts of electricity. 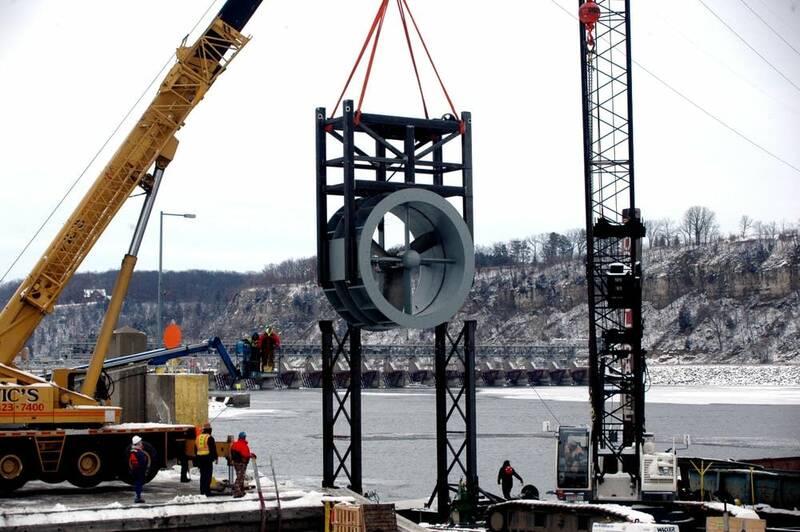 The turbine, 12-feet in diameter, will hang about three feet below the surface of the Mississippi River. The current will spin three blades, which will run a generator. A Texas company, Hydro Green Energy, is building the station and company Vice-president Mark Stover said the systems work at any scale. "You can have small scale projects like Hastings, you can have projects that are built in remote communities, small villages where you don't have high power demands, and where it's difficult to deliver power, but we're also able to build utility-scale power in the right setting," Stover said. The company will conduct studies to see whether the turbine harms fish. More than 60 Minnesotans have worked on the project and another unit will be installed in the spring. When the second unit is installed, the two could produce almost 200 kilowatts of electricity.